Most people will tell you Cars is their least favorite Pixar property. I certainly ranks low on my list of Pixar films but I've grown to have a greater appreciation for the series' first film over time. The second got way off track and really doesn't hold up. Fortunately the third is a bit of a return. 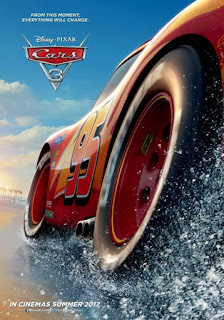 While I am still more interested in Pixar innovating with new stories, Cars 3 captures something nostalgic and charming which reminds me of what I do like about Lightning McQueen and his friends. The Cars series is mostly an appeal to the youngest of movie goers (certainly the Planes spin off caters to that demographic). But there is something for the old folks too in its call out to preserving older values. Cars 3 is about passing the torch, but not in a "retirement" sort of way, more in a finding new life sort of way. That being who you are doesn't mean things aren't going to change, but perhaps means that you grow into something new. There is also a nice story about the value and satisfaction one gets in moving from the mentored to the mentorer. If there is something interesting here it is in the way the film challenges our ideas of usefulness. Many cultures have a way of valuing elder statespeople in what they offer to their communities while western culture has moved away from that. Cars 3 is about finding that again. The story drags a little in the middle but picks up by the end, finds its groove and races across the finish line. This isn't Toy Story 3 and won't have you in buckets of tears. But it will make you smile and that in itself makes it good.